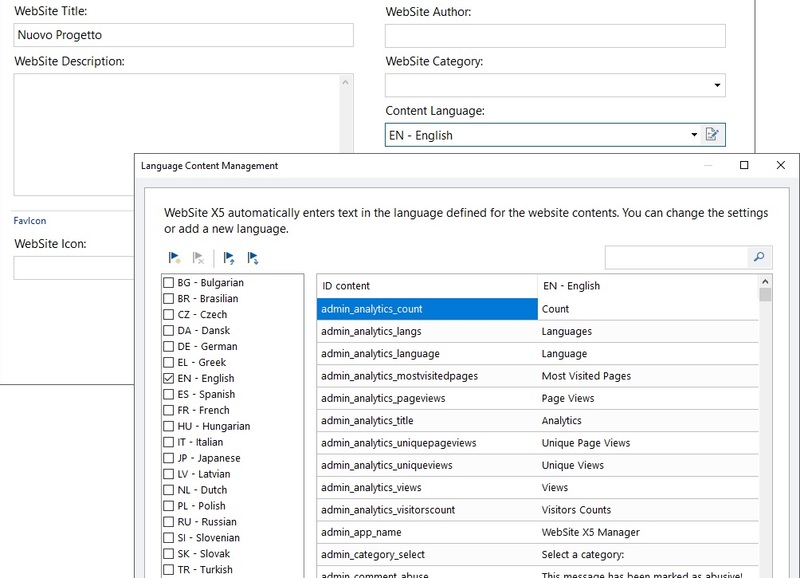 This window opens when you click on the button of the Content Language option in the Website Settings window. You can work on the text that the Program enters automatically, such as links to built-in anchors, the buttons in the Gallery Object, the labels in the Contact Form Object, labels and text in the e-commerce cart, text in the website's Map. 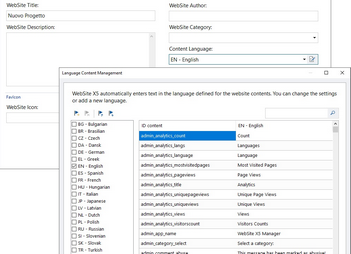 The Language Content Management window shows the list of available languages on the left and a table with the translations in the various languages on the right. The first column of the table gives indications of where the various items are used. Then there is a column for each active language (i.e. selected from the list of available languages). You can work directly on this table to edit items. Add a new Language: enter the name of a new language to add in the dialog box. You must use the format "ID - LanguageName", for example "EN - English". Remove the selected Language: this will remove the selected language from the list. Import a new Language: this imports a new language, saved as a .XML file, and adds it to the list of available languages. Export the selected Language: this exports the language selected from the list to a .XML file. In addition to these commands, you also have the Search field, where you can search for Content IDs and terms entered in the various languages: this makes it easier to find a specific item you want to work on. The Export the selected Language and Import a new Language options are useful when you want to save translations in a particular language in a .XML file and use it on another computer.